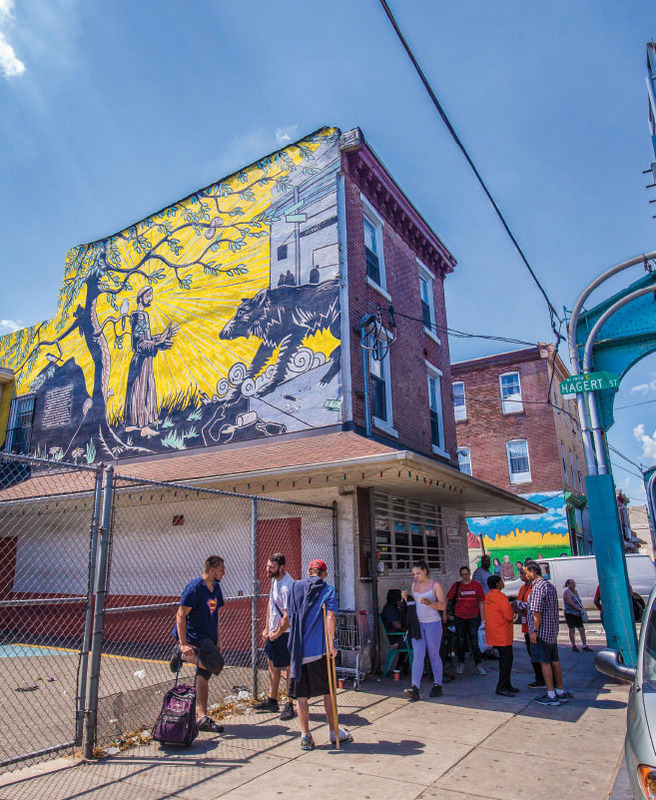 Hope leans on faith and charity in a broken-sidewalks section of Kensington in Philadelphia, where Johanna Berrigan ’97 runs one of the world’s few Catholic Worker free health clinics. 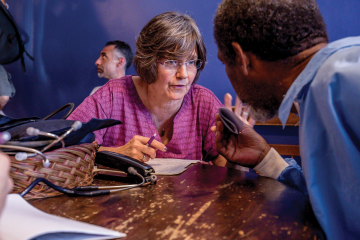 Though little known outside of Kensington, the Catholic Worker Free Clinic that Johanna Berrigan founded at 1813 Hagert Street in 1991 is part of a network of long-standing organizations providing care for the homeless, addicted, and under- or uninsured of Philadelphia. Within a few blocks, anyone in need will receive a free meal, clothes, shower and medical or dental care. It’s a spring morning in the Kensington section of Philadelphia. The pigeons are strutting, the Market-Frankford El is rattling overhead, and dozens of people are lining up to get a hot meal from St. Francis Inn, a Franciscan-run soup kitchen, and fresh clothes from Marie’s Closet, the order’s second-hand clothing center across the street. Down the block, another neighborhood lifeline is about to open for the day. The Catholic Worker Free Clinic has operated out of a converted rowhome at 1813 Hagert St. since its founding in 1991 by Johanna Berrigan ’97, a physician assistant who also runs the House of Grace Catholic Worker Community hospitality house alongside her own home a few blocks away on Lehigh Avenue. 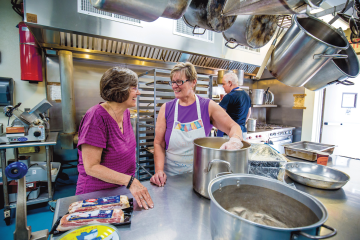 For more than two decades, Berrigan has been living here in voluntary poverty with her co-founder Mary Beth Appel, sharing their home with strangers, and providing care to a population that suffers from some of the most intractable ills of urban life. The volunteers smile at each other and begin welcoming visitors. The line for the showers forms right away. The intake room — really it’s a living room, with sheer curtains on the windows, a dozen or so chairs along the walls and filing cabinets filled with ad hoc medical records in the corner — starts to hum with activity. Some visitors are looking for treatment for wounds, or for bandaids, or aspirin, or just for someone to talk to. Many come for basic supplies like toothbrushes and razors. Volunteers set a 10-minute timer on the wall outside the shower stall and hand out soap and fresh towels. In the room behind the shower there’s a dentist’s chair for cleanings and extractions. Upstairs, in what used to be the bedrooms, volunteer nurse practitioners, physician assistants and doctors administer medical services and perform basic lab work. Berrigan is a licensed nurse and a 1997 graduate of the Physician Assistant Program at Drexel University, one of the oldest health care provider training programs in the country and the first in Pennsylvania. A core part of its mission is to treat the underserved. Last spring, the director of the program, Clinical Professor Patrick Auth, recognized Berrigan with an alumni award for her service on behalf of the vulnerable in Philadelphia, Haiti and Iraq. At 62, Berrigan has spent nearly half her life helping the people on these blocks — with calm, friendliness and with apparent fulfillment. As she makes her way from her car to the clinic, she seems to have a spring in her step despite a limp from a healing stress fracture in her foot. On the street, she repeatedly stops herself mid-sentence to greet people and make unhurried conversation. A woman sitting on a stoop near the clinic calls out to tell Berrigan she likes what she’s done with her hair. Inside the clinic, Berrigan talks to everybody. As visitors mill about the room, one begins to raise his voice. Berrigan knows him; he hasn’t been around for a few weeks. The man faces her and starts to talk more calmly. “When new people come in, it’s almost like they don’t understand that they don’t have to walk in with fear; they don’t know that they’re going to be accepted — until we say, ‘Let me tell you what we do here; you’re OK here, we’re going to help you,’” she says. Clinic volunteers treat a lot of wounds. They provide relief for thousands of colds every winter. They’ve seen frostbite and heatstroke. The clinic is open four days a week and on a typical day volunteers treat 10–20 patients and provide 10 showers — in all, since inception, the clinic has served nearly 100,000 patients and provided 50,000 showers. In recent years, opioid addiction — always present in Kensington, well before it was acknowledged as a nationwide crisis — has mushroomed, and it’s not unusual to see someone slumped in a doorway, nodding off, or shuffling in slow oblivion down the street. “I’m always watching to make sure somebody’s breathing,” says Berrigan, as she travels down Kensington Avenue to the clinic from her house. The heroin trade is accelerating alongside rising real estate values, and gentrification has brought the desperation of the most vulnerable into sharp relief. A few doors down from the clinic, developers are gussying up an old building into upscale lofts and erecting new rowhomes. “But I can’t forget the history,” Berrigan says, as she passes a grassy lot on Jasper Street and Sergeant, four blocks from the clinic. “One of our women was murdered right there; she walked the avenue and she was picked up by someone and stabbed.” Kensington’s crime rate remains the third highest in the city. In case of a crisis, the volunteers use a special code — “Dorothy Day is in the house” — that invokes the name of the woman who founded the Catholic Worker movement in 1933. But in the 26 years that the clinic has been open, Berrigan has called the police only once. And because of the way the cops treated the person — he was mentally ill and having a psychotic episode, and still the cops “were being far too rough with a frightened person” — she says she’ll never call them again, though she tells the volunteers they may do so themselves. Sometimes, people just need someone to talk to, and volunteers from JUST Listening, a local program that pairs people with judgment-free listeners, visit regularly. Another important role the clinic plays, Berrigan says, is helping patients navigate the official health care system. Many visitors have literacy issues, and volunteers help them fill out forms. Berrigan sometimes drives people to the doctor’s office or the emergency room. She gestures toward the shower. Later she introduces a man named Herb, 92 years old, who had first come to the clinic a few years before. McKenna’s husband had given him his shoes, a pair of New Balance sneakers. Herb was still wearing them. “And they’re good,” Herb said, looking down at his feet before making his way out the door. Of course, there are times when the work is upsetting, when it seems that the problems never change — that even individuals never change — despite the efforts of the Catholic Worker and other service organizations. But providing mercy isn’t necessarily about curing people. Like all Catholic Worker communities, the House of Grace Catholic Worker and free clinic is autonomous, disconnected from the hierarchy of the Church. 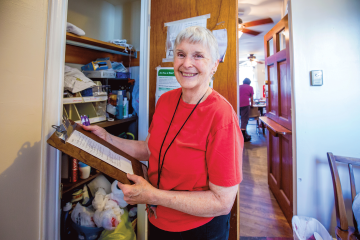 Though members of the Catholic Worker are allowed to work up to 12 hours a week on their own — and Berrigan does, covering two shifts a week at Health Center #6 on Girard Avenue — the mission of the community is sustained by private donations. The clinic runs on just $40,000 a year — a modest expense made possible by the all-volunteer staff and a mortgage paid off years ago. A list of clinic needs printed in the back page of every issue of the community newsletter testifies to its work: toiletries, men’s socks, reading glasses, toothpaste, deodorant, multivitamins, ibuprofen, acetaminophen, paperback books for the lending library, volunteer dentists and prayers were among the requests in a recent issue. Berrigan, who grew up in a Catholic household with nine siblings in Williamsport, Pennsylvania, says she wanted to be a missionary from the time she was a kid. There was no grand revelation or heroic role model, she says, but she remembers paging through the pamphlets in the back of church, building her awareness of suffering in far-flung places. She never encountered a Catholic Worker community — never even heard of Dorothy Day — until she was working as a nurse in Los Angeles in her late 20s. When she began reading about the life of Day — who had been at times a journalist, a socialist, a pacifist, and an anarchist, and is now being considered for sainthood — she decided to throw herself into the mission of the Catholic Worker, which is to perform works of mercy: feeding the hungry, giving drink to the thirsty, clothing the naked, offering hospitality to the homeless, caring for the sick, visiting the imprisoned and burying the dead. At the Los Angeles Catholic Worker, Berrigan met Appel, who also had ties to the Philadelphia area, and they moved back together and joined the Sister Peter Claver House, a Catholic Worker community that has served people in South Kensington since 1988. 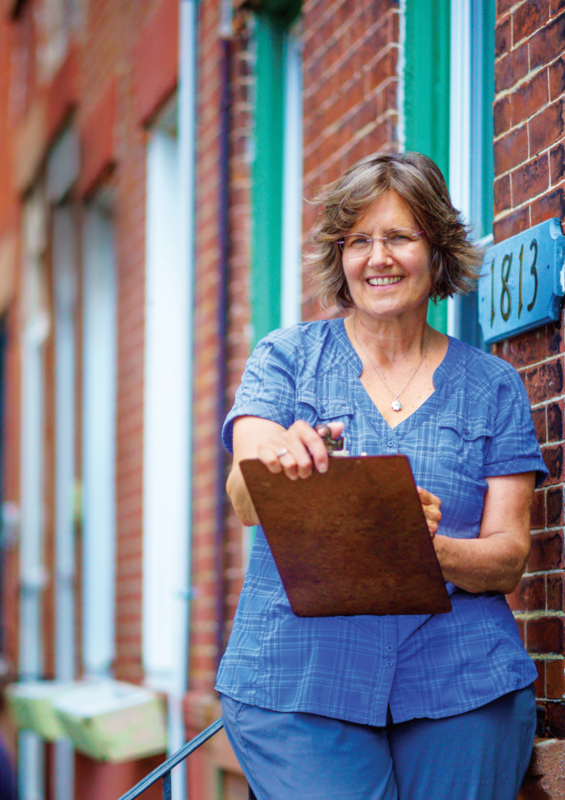 When they decided to open a free health clinic, they first set up in rooms above the St. Francis Inn, but soon their patients overwhelmed the space, so they bought the rowhome around the corner. Berrigan says she decided to pursue the physician assistant’s degree because it became clear to her that her role in the clinic would be very limited without further training. The Drexel program’s emphasis on providing care in underserved communities made it “the perfect fit,” she says. Toni Rust (BS nutrition ’77) prepares to numb a tooth for Roberto Diaz, who came to the clinic with decay that had infected the root. Rust is preparing to extract it. “Sometimes I get someone who just needs a cleaning, but the majority of people I’m putting them out of pain,” says Rust. 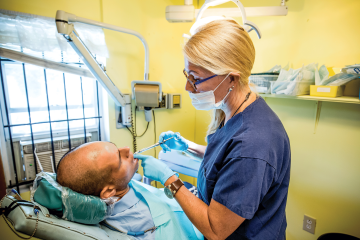 She has a private dental practice in Roxborough and has been volunteering at the clinic twice a month for nearly 20 years. Today, she and Appel live together on Lehigh Avenue. Several years ago, they bought the five-bedroom rowhouse next door, and now operate it as a house of hospitality, taking in homeless people for various lengths of time — most stay a few months, Berrigan says, but one family stayed for four years. They tend two community gardens in the backyard where they grow squash, peppers, tomatoes and healing herbs that they share with the soup kitchen, neighbors and a local coffee shop. It wasn’t just faith and a desire to serve that drew Berrigan in, though; it was also Day’s legacy of activism. In the late 1990s and early 2000s, Berrigan took a series of trips to Iraq to observe the effect of American sanctions on the civilian populations there. She began holding weekly peace vigils, and penned letters to the editor critical of the Philadelphia Inquirer’s coverage of the run-up to the second Iraq war. 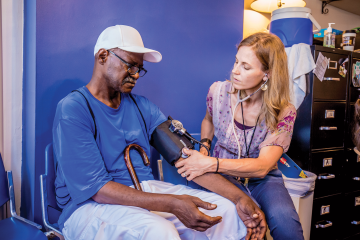 Earl Floyd, being treated by certified physician assistant Katie Huyhn, is among the underinsured who use the clinic for routine health maintenance such as blood pressure management. “Witnessing firsthand a policy that’s killed children, that’s continuing to kill children — that motivates you to become active, even if you didn’t start out an activist,” Berrigan says. In addition to her work in Kensington, Berrigan has traveled on health care mission trips to Afghanistan, El Salvador, Dominica and Haiti. In 2004, she co-founded Kay Lasante (“House of Health” in Haitian creole) Education and Community Outreach in Port au Prince, Haiti. It has since grown into a full-service clinic serving 40 patients a day; Berrigan continues to fundraise for it and serves on its board. In the winter of 2011, when the island was still recovering from a devastating earthquake a year before, she wrote about some of her experiences in Haiti in an issue of Gift of Grace, the community’s newsletter. One morning last summer, Berrigan was called to the yard outside of the St. Francis Inn to treat a heroin overdose. When two doses of the anti-narcotic medication Narcan failed to revive the young woman, Berrigan began making a prayer. “And when I bent down, she sat up, eyes open wide, and said, ‘What’s going on?’ And I said, ‘Honey, how do you feel?’ She said, “I’m fine!” And I said, ‘Honey, you were out; I thought you’d died,’ and she said, ‘Nah, I was just sleepin’.” Everyone in the yard started clapping, and it was almost funny, Berrigan recalls, but the situation could have gone the other way: “This was when everyone started becoming aware that we have a real opioid problem.” The clinic staff recently underwent a second round of training on how to administer emergency Narcan. Berrigan tells a story about a woman with a serious mental illness who used to come to the clinic, at first just to sit on the stoop. The woman was paranoid and never spoke. Eventually she started to come inside, take a shower, and would then immediately run out the front door. Slowly, Berrigan and the other volunteers began to convince her to accept some simple medical care, but still she stayed quiet. One day, Berrigan learned that the woman had been admitted to the hospital and undergone surgery for ovarian cancer. She went to visit her, and convinced her to come live with them in the house of hospitality. Reluctant at first, the woman ended up staying throughout her entire chemotherapy regimen. She became part of the community for a time, and then moved on. But a few years later, she knocked on the door. “My cancer’s back, and yous are the only people I have,” she said. After she died, the woman’s daughter tracked down the House of Grace and asked Berrigan and Appel to be part of the funeral services. To Berrigan, the story isn’t an example of the daily tragedies of the work, but of the daily triumphs. The community may be suffering in ways that have no ready prescription, but the Catholic Worker is a source of peace in the middle of that, as much a fixture of the neighborhood as its crime, poverty and addiction. Knowing what its presence has done for people inspires Berrigan to keep going.